Is Life Better with a Longarm Machine? It’s 12:14 a.m. and I’m working under a deadline to get a quilt done. I’d have finished this quilt two days ago. I’d get so many more quilts done. I’d be one Super Quilting Mama! And then reality sets in – sigh – and I keep plugging away with my little machine. Do you ever wish for a longarm machine? If so, what do you think life would be like with a longarm machine? Or if you already have one, is life really better with a longarm? I have those fantasies too. I even have the space for one. Alas, I don't have the budget for one. I'm loving the colors in this one – I can't wait to see more! Ohhhhhhhhhh I would love to have one!! I am a hand quilter, and enjoy it immensely, But I would really really love to have the space and afford a longarm to play with. They look like they would be so very interesting. I dream about owning one. But I would also need the money to buy one and a new house with the space for one, so it will have to stay a dream for now! I have the same dream! Sometimes I even dream about quitting my job after I buy a longarm — then quilting from home as my new line of work! Oh yes I do, especially given that my kids are getting older and one has moved out!! That means an empty room. But then reality sets in (aka the price). So I'll keep plugging along on my little Bernina. I wonder how long it takes to quilt a quilt on a longarm? You amaze me with what you do without a long arm. You are fantastic. I would love to have one of those big expensive machines with lots of quilting space. But I just can't justify the expense. I do have an Inspira Frame which holds my Pfaff sewing machine and it at least lets me do some quilting. However, I can't get the beautiful work that you do on your domestic machine. Yes, but where would I put it? the ping pong table already serves as my cutting table! I have had the whole long arm machine dilemma too. I test drove one and was quite close to getting one but then my 2nd child came along so I thought I would park it (the long arm dream, not the child) for a while. There is the space issue too. However the main thing about a long arm to me is that it just makes so much more sense to my brain – moving the needle instead of moving the fabric. Long term I think I will get one – but not until my kids are in high school. Which is about 10 years away! There are places you can rent one from in some areas, I think. My biggest issues are space and expense, too. It sounds lovely to have one and to be able to do all those very fancy, perfectly sandwiched quilts, but then I also worry that my skill level wouldn't warrant the money invested or that I'd lose that impressed look on people's faces when I say I don't have a long arm and did it myself. It would be so fun to have one. I've been sewing for such a short time though, so I can't really justify the expense. I think my husband actually wants one more than me. I always have to drag him away from the longarms at the quilt festival LOL! i have a longarm and i looove it. once you get the hang of it, it's so much quicker and easier on the body. like all of you, i had to wait tip the kids were bigger and the house could accommodate. but i'm living proof it can happen! I just want more throat space. I've done king size on my domestic. More space would be awesome, but a full set up? I don't know. Too much floor space. I'll be trying a handiquilter16 on a frame at QuiltCon for that quilting the negative space workshop. I reserve the right to change my mind. I also have a wall and floor space in my work room that can be dedicated if the funds appear. I dream of having a longarm machine, of making much more quilts than I'm making now, of having much more time for quilting. BUT: reality sets in – I don't have space for a longarm machine, I don't have the money to buy one (first of all I need a new used car, and I don't have time for more piecing quilttops, let alone learning the art of longarm quilting, because I work fulltime and have two kids. I confess, it crosses my mind too. I really should rent space on one a few times to see how I enjoy it. And I don't know if I'd really want to go into business with it – would that take away from the fun of my own creating? Not sure….but definitely worth considering! Every time I quilt or am in the midst of deciding what type of quilt design I want to apply to my quilt, I wish I had a longarm machine. I feel it would be "sky's the limit" for me if I had one. But like most of those who have previously commented, space and expense is an issue – so my reality is to keep honing my skills on my little Janome. Ah yes, constant dreams. But like everyone has mentioned, the budget is a big issue! Maybe someday…am looking forward to hearing your class experiences. Yes, I would love a longarm machine. My husband is convinced if I had one I could make money on my quilting instead of just spending. I don't want to have to earn money to have one. I don't like the pressure of having deadlines and being responsible for other people's masterpieces. What if I ruin it then what. I would love to be able to quilt my own quilts and that would be a huge savings as I spend about $1500 a year having quilts quilted professionally. So it would pay for itself fairly quickly. My fantasy became a reality last January. I love my longarm, however there are challenges with that too. Tension…ah, tension, it is a different animal on a longarm compared to your domestic machine. It takes up a lot of space, luckily I have the space. It costs a lot of money and I mean a lot – think 'car payment.' And there are not enough hours in a day to piece, quilt and a full-time job. I love the satisfaction of starting and finishing my own quilts, I'm glad I made the investment. Now, if someone could come up with some kind of magic binding machine my world would be perfect. Congrats on fulfilling your fantasy! And thank you for sharing about the realities of owning a longarm. It's so easy to fantasize about what it would be like to own one and forget about the realities. Oh yes. I recently got a "George" and I know I will like it but I just haven't had the time to really become acquainted with it. I do wish it had feed dogs!!! But I haven't found a quilting machine out there with feed dogs and a 18-20 inch throat. I do like a sit down machine! I am with you! I have two adult children still at home so not happening yet. I will probably buy used when I get mine. If my neighbor gets one first then I'll con my way into using hers! The problem with that is they probably don't want me over there late at night quilting while they are sleeping. LOL! I do find myself dreaming of the same thing. However, for me I would still probably only produce at the same rate because of my attention in so many other places. I would LOVE a longarm. I just invested in one of the new Bernina's, though, so buying another expensive machine is so far off in the future… but I can still dream, right?! I even have the space for it! Congrats on your new Bernina! Yes, keep the dream alive and keep the space available! Not even an option for me. My fabric is in our bedroom closet, the regular machine in our bedroom, and my cutting table blocks the front door of the house when it's set up. There are a few local places that let you rent a machine, but I haven't even been able to commit to the several hours straight that it would take to do that, so for now, my own machine is just fine… I've never used a long arm but I'd suspect that there are limitations for them as there are a regular machine… Hang in there! Oddly enough I know a place that I can go to use one, but have never got round to it yet – ironically, not enough time! I recently got a mid arm (like a long arm, but not as expensive). I love it. But to put it in perspective, I had a hard time doing baby quilts on my other sewing machine, so anything would be better. I saw a few other comments about just getting a machine with a larger throat and I was going to suggest that too. But I'd be happy to tell you a little more about mine if your interested. Yes! Tell us more! I am interested in one of those or a long-arm, but the price difference!! So many people have told me that you can make lots of money quilting for others on a longarm, though. I am still not sure I believe them! Funny you should ask about a longarm. Recently (with 2 weeks notice) my son asked for a new homemade quilt for his King-size bed. While i knew i could finish the patchwork and the hand stitched binding, the quilting could not be done in time unless i found 7 willing dwarfs to stay up all night. However luck prevailed and i found a woman through our "sewing referral network" — she had a longarm machine and said it would be easy to make the deadline. Her husband and her both quilt and they said the long arm was a wonderful investment (and saves their backs) There was a learning curve but once they invested in the special weight thread the machine likes it is the way to so many great projects. Her price to do a King-size quilt was $140 (and to me for a birthday gift) that was very affordable. It was stunning and perfectly quilted in a "stippled" or puzzle piece pattern and i am so very pleased – i actually cried with joy. I just happened to get one yesterday! Granted it's used, 7 years old and I'm splitting it with my mom to make it affordable but it is great. It happily lives in my basement and although I've only quilted one throw quilt so far I think it will be awesome. From loading it on, quilting and taking it off took an hour. Far less time than on my regular machine and the results are much much better! 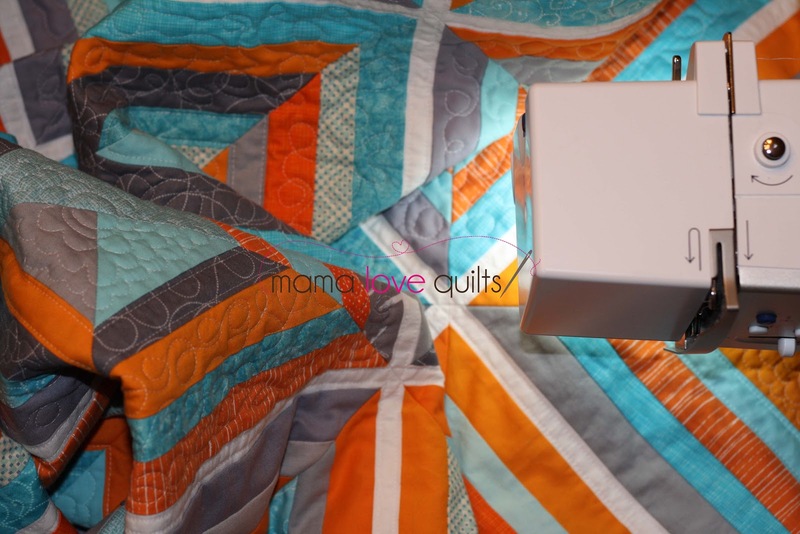 Heidi, first of all, your quilt is gorgeous…love the colors! Secondly, I recently (2 weeks ago) purchased a longarm and so far am loving it. The tension has been a little rough figuring out on this machine though. Of course the only reason I was able to swing it was by getting a used machine and splitting the cost with my Mom 🙂 I'm pretty sure I won't be regretting it anytime soon. If you are really serious about getting one, you might wantn to check into some used options. Certainly fit my budget a lot better than new! If you want to make money, then a long arm is the only way. I love touching and moving the quilt. I love watching the stitches happen up close. I don't enjoy standing for long periods. I always say…just because you can doesn't mean you should. Just because you can go fast with a long arm doesn't mean you should or will depending on the complexity of the quilting. I have access to a longarm and prefer to use my Juki. Your string quilt looks awesome!! You're going to do a great job at your class! I can definitely relate to the longarm covetous-ness. I've been socking away some $$ to buy a used one (I still have a ways to go), and I watch craigslist like a hawk for any local opportunities. I'm grateful to have a machine that allows me to do a lot of intricate quilting already, but I'm eager to "move up." I try to stay grounded in reality about it though – it won't solve all my quilting problems and will probably create a hundred new ones; no doubt it will come with a crazy huge learning curve, and then everyone always talks about the tension problems that plague them. Depends….I quilted a 40×50 quilt in less than an hour last Friday. My husband gave me 2 hours to prepare batting, quilt, cut and prepare my binding and attach. I did it! It would NEVER have happened without the LA! The quilting? Meandering loops with some "Mickey" heads. Anything more intricate, larger, or heavy can seriously take some time. Definitely a learning curve too. I bought a class/demo at the Houston quilt show last year!